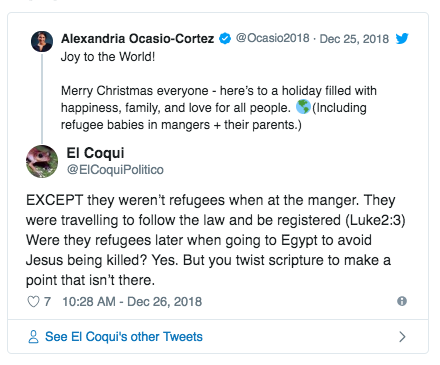 U.S. Rep.-elect Alexandria Ocasio-Cortez (D-N.Y.) said in a Christmas tweet to her followers on Tuesday that Jesus was a “refugee” when born in Bethlehem. 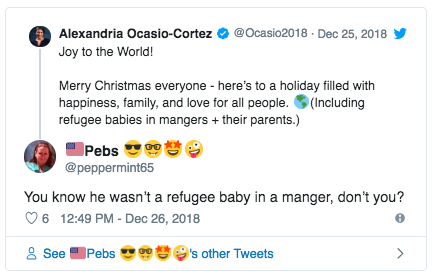 She wrote in the tweet that Christmas is a “holiday filled with happiness, family, and love for all people,” that that includes “refugee babies in mangers + their parents,” labeling Mary and Joseph as refugees as well. 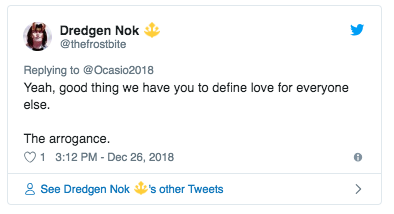 She followed that message with another tweet, saying, “True love is radical because it requires us to see ourselves in all people. Otherwise, it isn’t love." 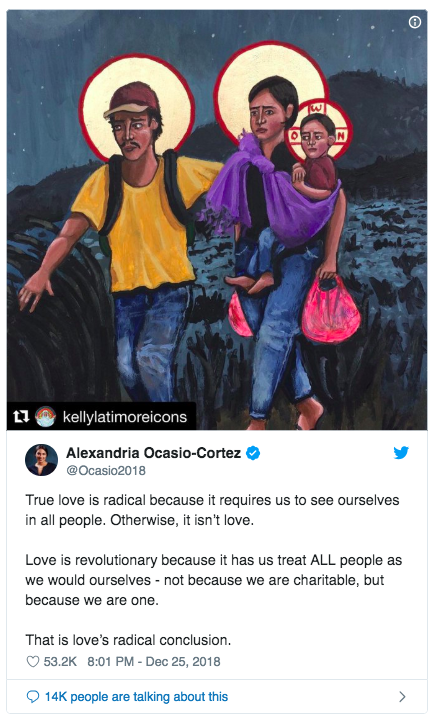 The tweet was accompanied by a picture of three migrants with halos, presumably a father, mother, and their child, suggesting they mirror the Holy Family. 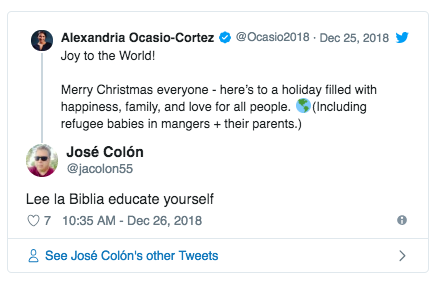 Ocasio-Cortez in defense of her initial Christmas message tweeted an article explaining how she came to that conclusion. The article explains that in the Gospel of Matthew, the Holy Family were forced to flee Israel to Egypt after King Herod of Judea ordered the murder of all boys under the age of two. “A family is forced to flee their homeland for fear of persecution. This is the classic modern-day definition of a refugee,” the article written by Jesuit priest Rev. James Martin S.J. reads. Though what she didn’t understand or seem to know is that the birth of Jesus and the Holy Family's "flight to Egypt" were two separate events. 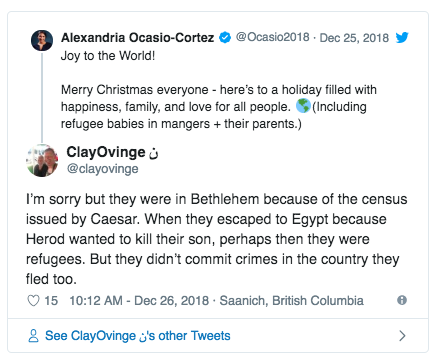 It’s also still debated whether they were actually refugees because both Egypt and Israel were part of the Roman Empire. 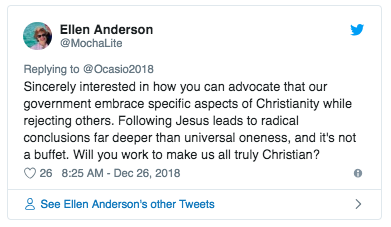 Many responded to her tweet, criticizing her for appropriating the Bible for political gain, albeit incorrectly. Others called her on her liberal hypocrisy. 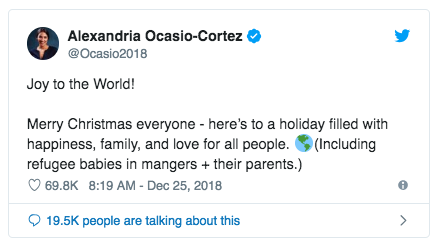 Ocasio-Cortez’s tweet comes amid a partial government shutdown and raised tensions over immigration and the need for border security. The issue of illegal immigration and the migrants who traveled via caravan and are waiting at the border to apply for asylum also have nothing to do with those who come to the U.S. as refugees. Just worth nothing.